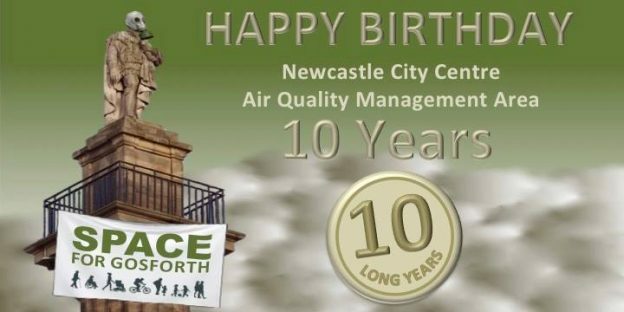 Newcastle City Council have announced they will be holding a Policy Cabinet meeting to discuss the plan that Newcastle has been asked to create by the Government in order to ensure the currently illegal air quality in the city meets legal targets in the shortest possible timescales. This event is open to all interested stakeholders. If you wish to attend please confirm your attendance by emailing julie.campbell@newcastle.gov.uk so the Council can anticipate numbers, and please let us know too. Written submissions, in advance of the meeting are also welcome and can be submitted via the same address. 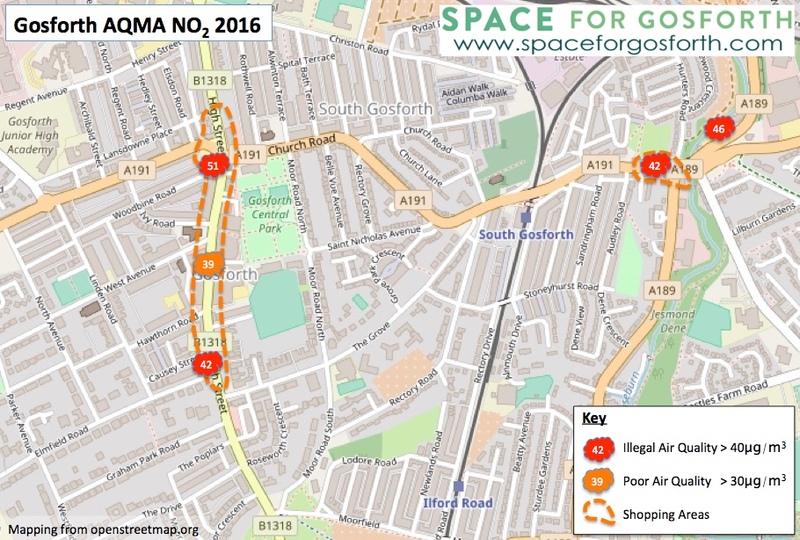 SPACE for Gosforth has made the following written submission to the meeting and we look forward to hearing how the Council intend to address poor air quality across the city. As a result of persistent and illegally high levels of road-side NO2 air pollution in Newcastle upon Tyne, residents of the city have had and still have increased risk of cancer, heart failure, asthma, lung diseases, cognitive delay in children, dementia, sperm damage, infertility and premature death. 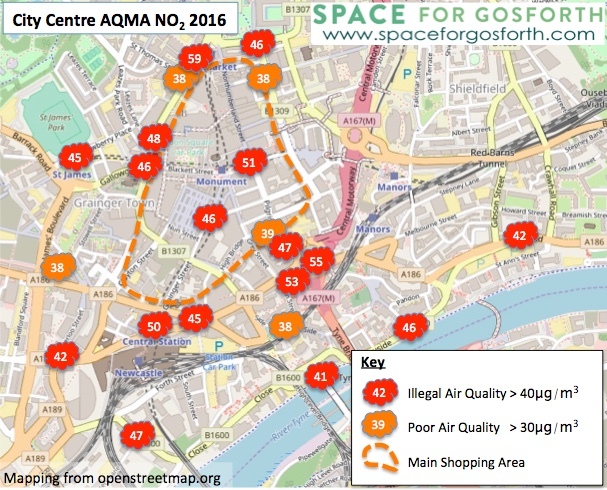 The City Centre and Gosforth Air Quality Management Areas (AQMAs) were set up in 2008 with air quality targets due to be met by 2010, but most recent Council figures for 2016 show illegal levels of pollution remain in both AQMAs. It is clear that the plans put in place by Newcastle upon Tyne, as well as other UK cities, were inadequate and have failed. As a result of this the UK Supreme Court has determined that there is a “clear and grave hazard to human health” and that new plans must commit to drastically cut pollution as soon as possible. Newcastle City Council therefore has a moral and legal duty to act without delay to reduce air pollution to within legal limits as soon as possible to avert this grave hazard, and to use whatever means are available to it to do so including the following measures identified by the Supreme Court: traffic planning and management; congestion pricing; parking fees; low emission zones; other economic incentives. We believe that based on a combination of the above the Council has sufficient measures available to it to create a plan compliant with the UK Supreme Court and High Court rulings. While we understand there may be concerns about the cost or impact of these measures, the Council should note that in November 2016 the UK High Court ruled that the government could not use these as reasons to delay its plan to meet air quality targets. We believe that many of these concerns may in fact be unfounded, as there is substantial evidence to suggest a wide range of benefits covering health, accessibility, economy and environment that can be all achieved through investing in active travel. We therefore urge the Council to act urgently, starting now, to take all necessary steps to ensure that Newcastle’s air is fit to breathe and to protect the health of its residents. 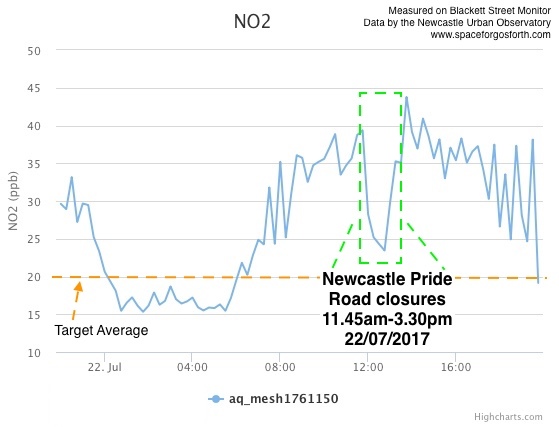 Data from air quality monitors at locations across the city shows that air quality breached legal limits for NO2 in 2016 in many other parts of the city including Newcastle city centre and in Gosforth. The average 2016 NO2 levels for the Gosforth AQMA and for the city centre are shown below. 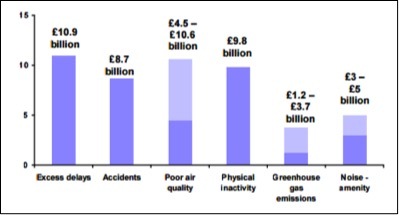 The 2009 Cabinet Office report “The wider costs of transport in English urban areas” identified and quantified six types of societal costs of transport: excess delays, accidents, poor air quality (particulate matter as well as NO2), physical inactivity, greenhouse gas (GHG) emissions, and noise. This report estimates each of these six types of societal cost as being of a similar order of magnitude. We have evaluated Gosforth High Street in terms of these six societal costs. Fig 1: Comparison of the wider cost of transport in English urban areas (£ billion per annum, 2009 prices and values. Transport, which is predominantly based around petrol/diesel vehicles, has a wide range of impacts, of which some (greenhouse gas emissions, noise and local NOx air pollution) can be improved by switching to electric vehicles (EVs), while others (excess delays, accidents, physical inactivity and particulate matter) cannot. It is also important to note that the health effects of particulate matter are more significant than those of other air pollutants, and that particulate matter emissions from electric vehicles are comparable to those of petrol or diesel vehicles. Air pollution can only be resolved with fewer and cleaner cars. Modal shift from driving to public transport and active travel (walking and cycling) are effective methods of reducing NO2 emissions while also delivering multiple other positive outcomes (such as health and economic benefits, reduction in particulate matter, greenhouse gas emission reduction, and improved mobility for those who do not drive). Berlin has implemented a low emission zone that bans all diesel vehicles and petrol vehicles that failed to meet emission standards. The zone covers 88 sq. km of the inner city and approximately one-third of Berlin’s inhabitants. We are particularly concerned about NE1 repeatedly promoting free parking for ‘Alive After Five’ without mentioning public transport or active travel alternatives despite the fact that air quality breaches legal limits in the city centre and in Gosforth. Client Earth is suing cities abroad under EU air quality legislation and the council should be considering how NE1’s promotion of free parking would look in court if the City Council were to be sued. We estimate that the council subsidy for free parking could be as high as £16.4m over five years (more info in our ‘Alive After 65’ blog). This is money that could be spent on reducing air pollution, or on essential services if air pollution is no longer an issue. Bogota has implemented a bus rapid transit system that moves high volumes of people at speed through an extensive network of dedicated bus lanes. Seville is a great example of what can be done very quickly and gives a benchmark for ‘the shortest possible timescales’ as required by the court. Seville built enough connected, safe lanes to result in the number of bike trips multiplying 11-fold in just a few years. Calgary has rapidly implemented a complete city wide cycle network. Providing better public transport and enabling more people to feel safe walking or cycling is an investment in both public health and social mobility. Almost half of households in Newcastle upon Tyne do not have a car so providing good alternatives to driving enables affordable access to employment and educational opportunities. Cars are expensive to run for young people particularly hard hit by the cost of insurance on top of the prospect of getting further into debt to buy a car. It’s probably no coincidence there was an upsurge in cycling at the time of the credit crunch. It is a matter of social justice that there should be some choice for everyone in how they travel including low cost / healthy options and for each of those choices there ought to be a reasonable chance of arriving safely. The council is responsible for reducing air pollution, has the means to do so and will be held accountable if it fails. For a plan to be effective it has to be based on two actions – (1) reducing vehicle movements and (2) providing alternative travel options. The Council should create a plan using the measures that are available to it. If the council believes that further powers or measures would improve the plan, it should ask the government for those powers however, those additional measures should only be incorporated into the plan once they have been approved by the Government. the council is currently reconsidering its approach to bus shelters. Will reducing the number of shelters to save money undermine modal shift from cars to buses? Would real time travel information at bus stops encourage bus use? can the North of Tyne devolution enable Newcastle to work with North Tyneside and Northumberland to prevent their planning and development decisions resulting in increased traffic coming into Newcastle, with air pollution for Newcastle residents? Can the Transport for the North strategy provide better public transport options from neighbouring authorities into Newcastle to reduce the number of commuter cars entering the city? without wider action on planning and development and better regional public transport, traffic from residents in Northumberland and North Tyneside and other areas will continue to pollute Newcastle. It is also Newcastle that risks being the subject of litigation for its failure to tackle polluted air. There is no justice in Newcastle residents suffering the pollution created by others and also potentially bearing the financial brunt of any litigation. On 2 July 2017 parts of Newcastle city centre were closed for a cycling event. Part of the route for the day passed an air quality monitor in the city centre. 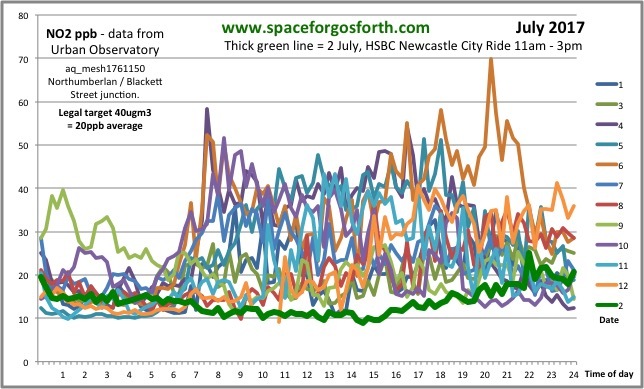 The graph below shows that levels of NO2 on 2 July (the dark green line) were much lower than on any other day in July. This also shows how legal compliance can be achieved almost instantly by reducing traffic levels. Later in July there was a further brief road closure for the Newcastle Pride march. Even though this lasted only a few hours, levels of NO2 reduced significantly in that short period.